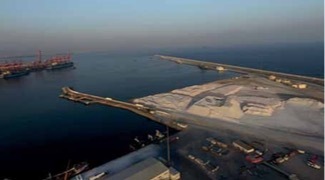 Dry bulk traffic at the Omani port of Salalah was up 22% last year to 12.54mt (million tonnes), the majority of it being locally mined limestone and gypsum. Traffic had risen by 30% the previous year, too, and is forecast to rise once more in 2016, according to CEO David Gledhill, thanks to the opening of new berths at the General Cargo Terminal last year. “The General Cargo Terminal achieved these results through operational planning and efficiency, improvements and innovation, including the completion of a government-funded expansion and the inauguration of new berths in December 2015,” he said. In December, the port officially opened a new deep-water General Cargo and Liquid Bulk Terminal, which is capable of handling up to 20mt of dry cargo, in addition to 6mt of liquid bulk. The facility, which has 1,266 metres of berthing line, is situated on the leeward side of southern breakwater. Two 320-metre berths are given over entirely to dry bulk. Gledhill notes that rising demand for both limestone and gypsum means that more than 1mt a month will be handled at the terminal. “This increased volume will be achieved thanks partly to the expanded berths that became operation in December 2015 and planned investment in automated equipment for handling aggregates. An anticipated increase in the importation of grain and other general cargo will also benefit the terminal,” he suggested.